Shopping has become a hobby for the new generation.. The whole concept of shopping has altered with time, in terms of format and consumer buying behavior. Thanks to rapid urbanization and sprawling shopping centres, multi-storeyed malls and huge complexes that emerge at an ever increasing speed in every upcoming city, retailing has grown into one of the largest sectors in the global economy, and a booming industry in the present century. Retail Industry, one of the fastest changing and vibrant industries in the world, has contributed to the economic growth of many countries. The term 'retail' is derived from the French word retailer which means 'to cut a piece off’ or ‘to break bulk'. Retailing is a vital part of the business industry that involves selling products and services to consumers for their individual or family use. Retailing can also be defined as the timely delivery of goods demanded by consumers at an affordable and competitive price. It is a vertical and people-oriented business industry. Retail business in India boomed in the 80's and within a sport span of time, Indian retail industry has been rated as the fifth most attractive, emerging retail market in the world. Indian retail industry which account for over 10 percent of the country’s GDP (gross domestic product) and around eight percent of employment, is expected to grow at a compounded rate of 30 per cent over the next five years. Retailing process involves a direct interface with the customer and the coordination of business activities from the design stage of a product to its delivery and post-delivery service. Generally, retail business can be classified into several types depending on their size, shape, product lines, amount of service they offer and prices they charge etc. Some among them are specialty stores, supermarket/ malls, factory outlets, franchises, chain stores, discount stores, lifestyle & personal products, furnishing & house hold appliances etc. 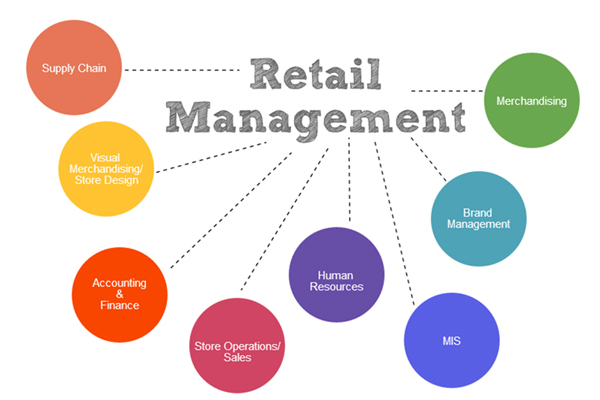 As a career, retail management is a dynamic field that offers affluent employment opportunities for talented youth. It offers around 2 million job opportunities worldwide. Basic educational qualifications, as well as personal skills like good communication and analytical mind is needed to outshine in this profession. Even though related with selling, not all the job opportunities in this field is in the stores/outlets themselves. In this career, one will get openings in sales and marketing, operation, concept and design, buying and merchandising and also in administration. The economic boom and the enormous expansion in the retail sector make this career most sought after. As the competition in this field is very tough, nowadays the shopping malls are doubling up as leisure and entertainment centers, to attract customers. Those who wish to be in this field must be creative and should have new ideas to promote their business. Many multinational companies have come forward in the retailing business. Reliance Group, ITC Retail, Aditya Birla Group, Tata Groups Trent & Westside, Subhiksha, Shoppers Stop, Future Groups Big Bazaar & Pantaloons, Apparel Chains, Raymond's, Arvind Brands, Lifestyle International, Spencers etc. are some of the top companies.